This image presents the Helix Nebula first at optical wavelengths, as seen by the Hubble Space Telescope, then by Herschel’s SPIRE instrument at wavelengths around 250 micrometers. A spectrum is shown for the region identified on the image, showing the clear signature of CO and OH+ emission in the clumpy outer regions of the planetary nebula. Using the Hubble Space Telescope and ESA’s Herschel Space Observatory, astronomers have discovered a water-building molecule in three planetary nebulas. Using ESA’s Herschel Space Oobservatory, astronomers have discovered that a molecule vital for creating water exists in the burning embers of dying Sun-like stars. These actually have nothing to do with planets, but were named in the late 18th century by astronomer William Herschel, because they appeared as fuzzy circular objects through his telescope, somewhat like the planets in our Solar System. Over two centuries later, planetary nebulas studied with William Herschel’s namesake, the Herschel space observatory, have yielded a surprising discovery. While supernovas are capable of forging the heaviest elements, planetary nebulas contain a large proportion of the lighter ‘elements of life’ such as carbon, nitrogen, and oxygen, made by nuclear fusion in the parent star. 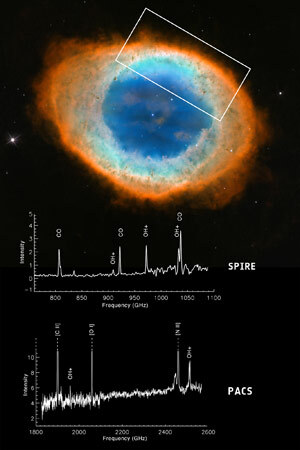 The Ring Nebula at optical wavelengths as seen by the Hubble Space Telescope, with Herschel data acquired with SPIRE and PACS over a wavelength range of 51–672 micrometers for the region identified. The spectra have been cropped and the scales stretched in order to show the OH+ emission, a molecular ion important for the formation of water. ESA’s Herschel space observatory is the first to detect this molecule in planetary nebulas – the product of dying Sun-like stars. This intense radiation may destroy molecules that had previously been ejected by the star and that are bound up in the clumps or rings of material seen in the periphery of planetary nebulas. But in two separate studies using Herschel astronomers have discovered that a molecule vital to the formation of water seems to rather like this harsh environment, and perhaps even depends upon it to form. The molecule, known as OH+, is a positively charged combination of single oxygen and hydrogen atoms. In one study, led by Dr Isabel Aleman of the University of Leiden, the Netherlands, 11 planetary nebulas were analyzed and the molecule was found in just three. What links the three is that they host the hottest stars, with temperatures exceeding 100,000ºC. “We think that a critical clue is in the presence of the dense clumps of gas and dust, which are illuminated by UV and X-ray radiation emitted by the hot central star,” says Dr Aleman. Meanwhile, another study, led by Dr Mireya Etxaluze of the Instituto de Ciencia de los Materiales de Madrid, Spain, focused on the Helix Nebula, one of the nearest planetary nebulas to our Solar System, at a distance of 700 light years. The central star is about half the mass of our Sun, but has a far higher temperature of about 120,000ºC. The expelled shells of the star, which in optical images appear reminiscent of a human eye, are known to contain a rich variety of molecules. Herschel mapped the presence of the crucial molecule across the Helix Nebula, and found it to be most abundant in locations where carbon monoxide molecules, previously ejected by the star, are most likely to be destroyed by the strong UV radiation. The two studies are the first to identify in planetary nebulas this critical molecule needed for the formation of water, although it remains to be seen if the conditions would actually allow water formation to proceed. “The proximity of the Helix Nebula means we have a natural laboratory on our cosmic doorstep to study in more detail the chemistry of these objects and their role in recycling molecules through the interstellar medium,” says Dr Etxaluze. “Herschel has traced water across the Universe, from star-forming clouds to the asteroid belt in our own Solar System,” says Göran Pilbratt, ESA’s Herschel project scientist. Images: Hubble image: NASA/ESA/C.R. O’Dell (Vanderbilt University), M. Meixner & P. McCullough (STScI); Herschel data: ESA/Herschel/SPIRE/MESS Consortium/M. Etxaluze et al. ; Hubble image: NASA/ESA/C. Robert O’Dell (Vanderbilt University) Herschel data: ESA/Herschel/PACS & SPIRE/ HerPlaNS survey/I. Aleman et al. Be the first to comment on "Astronomers Discover Water-Building Molecule in Planetary Nebulas"